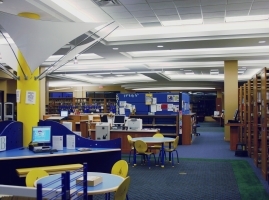 Working within the confines of an existing structure, while helping to develop the library standards for operation for the communities first library was a challenge, however successful cooperation between the Commerce DDA and adjacent country club allowed GHA to balance function and aesthetics for the new 12,000 square foot facility. 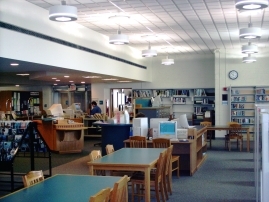 Funded by the State of Michigan Library and Federal Block grants, this project included the following interior renovations: rearrangement of library services and circulation, upgrades to lighting, electrical, communication and computer systems, asbestos abatement and facilitating temporary off site storage for library media. 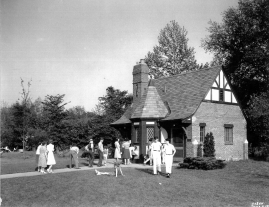 Designed in the early 1900's in the style of train station ticket booths, these comfort stations were renovated with a keen eye for detail. Maintaining the integrity of the building material's, color and detailing, renovations were made to the facade, plumbing, mechanical, electrical systems and barrier-free compliance. Master planning for complete renovations of the DPS facility and surrounding yard included a 38,700 square foot building housing offices, shop and garage, relocation of the salt dome, new material storage and recycling, new fueling station, fire training tower and batting cages at the adjacent baseball fields all on a 4.5 acre site. Preserving the character and traditions of this quaint village was important in the traditional design of this facade. The 9,600 square foot building blends function and technology with traditional detailing for a user friendly community focal point.